As we age, your teeth tend to lose their natural pearly look you were born with. Over the course of your life, your teeth are exposed to many things that affect the color of your teeth. For aesthetic purposes, many people chose to look to teeth whitening as a viable option to enhance the pearly look of their teeth. At Brandywine Smile Center, we believe everyone should feel confident enough to smile wildly. Often times, we find that patients are hesitant to undergo teeth whitening because of misinformation they have heard or read. 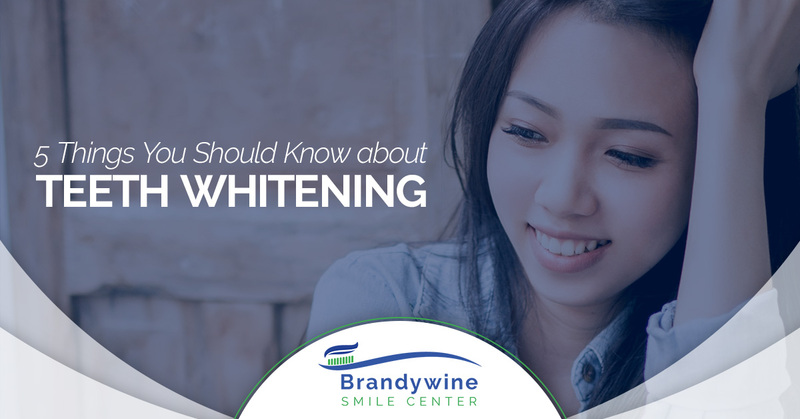 To help you feel better about teeth whitening, we have compiled a list of things you should know about it. #1 Teeth whitening is not dangerous. Of course, like anything else, teeth whitening has the potential to be dangerous, if the wrong product is used, used incorrectly, or used in excess. Professional teeth whitening, however, is incredibly safe. In the professional teeth whitening process, ingredients are used to temporarily open the pores in your teeth so that stains can be removed. Once the session is over, your teeth are rehydrated and are remineralized to their pre-whitened status, only without the stains! #2 Laser or UV light teeth whitening is temporary. UV light teeth whitening is done by using a whitening gel and then exposing it to ultra-violet (UV) light. The UV light accelerates the reaction that causes the gel to whiten your teeth. Although the process is relatively effective, it is not a permanent solution and must be maintained with regular re whitening. One marketing tactic that some in-home self whitening companies use is offering a blue light that “helps amplify the whitening process.” Unfortunately that just isn’t true. Although the light is blue, which may appear to be UV, it is just a blue light and only works on a psychosomatic level and actually does nothing. #3 Artificial teeth and teeth parts cannot be whitened. If you have any sort of artificial materials in your mouth such as caps, veneers, and false teeth cannot be whitened. The good news is they also cannot be stained. Where this becomes a whitening issue is when your veneers were matched and implanted with stained teeth and then you get professional whitening that affects the rest of your teeth and leaves a stained tooth. Conversely, if you had your veneer or false teeth placed a long time ago and your teeth have since been stained, they may be pearly white while your natural teeth appear dingy. This is a perfect reason to have your teeth professionally whitened! #4 Not everyone’s teeth can achieve a pearly white. 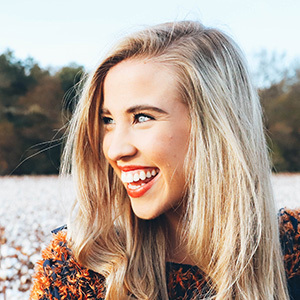 The natural color of your teeth is determined at birth before your teeth even emerge through your gums and have the opportunity to be stained or whitened. Genetics and prenatal exposure play a big part in what color your teeth will be. Teeth whitening procedures cannot alter the natural color of your teeth, and can only remove stains on your teeth. If your teeth were not pearly white to begin with, no amount of teeth whitening will produce white teeth. #5 Your teeth absorb like sponges. All of your teeth are covered in tiny pores, just like your skin. Anything that you put into your mouth will absorb into those tiny pores. The problem is that darker colors that your teeth have repeat exposure to, will eventually become stains. Common offenders of altering the color of teeth permanently include coffee, wine, and cigarettes. Overt time, these substances take up residence in your teeth and stay. Although teeth whitening procedures will work to remove the stains, if exposure to the staining product is not eliminated, teeth whitening will have to occur regularly. If your teeth have been exposed to these substances for many years, it is unlikely that a single whitening session will remove the stains, but should make a great improvement. If you avoid smiling because you are embarrassed by the color of your teeth, make an appointment for safe, professional teeth whitening now! Don’t hide your smile and face from the world, fix the stains that make you feel uncomfortable. At Brandywine Smile Center, we take great pride in creating smiles that our clients can feel confident in showing off — your smile says it all! Contact us today for your consultation.